DALLAS Semiconductor, represented by Arrow Electronics , has introduced the DS1375 digital-input real-time clock (RTC), a low-power clock/calendar that does not require a crystal. It operates from a digital clock-input pin at one of four frequencies: 32.768kHz, 8.192kHz, 60Hz, or 50Hz. The RTC maintains seconds, minutes, hours, day, date, month, and year information. The date at the end of the month is automatically adjusted for months with fewer than 31 days, including corrections for leap year. The clock operates in either the 12-hour or 24-hour format with AM/PM indicator. 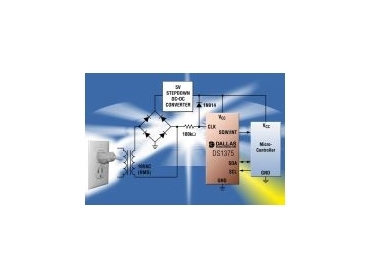 Two programmable time-of-day alarms and a programmable square-wave output are provided. Additional user storage is provided in 16 bytes of SRAM. Address and data are transferred serially through a 2-wire bidirectional bus that operates from 1.7V to 5.5V. The device is well suited for appliances and consumer electronics. The DS1375 is rated for operation over the industrial temperature range (-40°C to +85°C) and is available in a 6-pin thin QFN package.